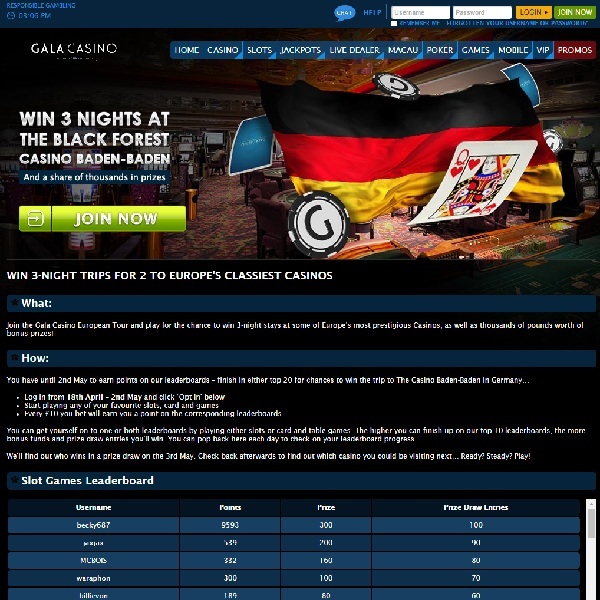 Gala Casino has moved onto the next stage of its Casino Trips promotion and is now giving you the chance to win three nights at the Black Forest Casino Baden-Baden. To be in with a chance of winning the trip you need to play at the casino and earn points on the leaderboards, there is one for slots and one for table and card games. If you finish in the top twenty of either then you could win the trip to Germany. Each £10 bet on games will earn you a point on the leaderboard and the higher you finish on the leaderboard the more prize draw entries you will receive. As well as entries to the prize draw you can also win a share of thousands of pounds of bonus prizes. Therefore if you finish at the top of a leaderboard not only will you win 100 entries, but you will also receive a £300 bonus.